When I was walking through Duty Free at Easter, the bright packaging of this Rituals Express Your Soul range caught my eye so I stopped to take a smell & was immediately entranced. It's funny how a scent can instantly transport you to another time and this product instinctively made me think of my Granda's garden because he always had Verbena flowering in the summer but also always had a lemon balm plant at his front door and he would give me some to put in my handbag from when I was around 5 right through to adulthood so that lemon scent is one that I love. If you like uplifting, citrus scents then this Express Your Soul range will be for you! There was a bit of a queue in the shop so I didn't buy any products that day but when I got home, the memory of the scent was still making me smile so I ordered two products online.There are six products available in the range: a shower foam, a shower oil, a body scrub, a body cream, bed & body mist and fragrance sticks (diffuser). I bought the shower oil and body cream but I have a feeling I might be placing another order because I love the scent so much! All of the products carry the shades of lemon, lime and green in the packaging, designed by graffiti and mural artist, MadC. I really like it - it's eye-catching and very summery. All of the products are scented with Verbena and Petitgrain - the verbena scent is very invigorating and uplifting and the petitgrain is slightly floral - both of which combine to make the perfect summer scent. The shower oil is quite light textured, given that it's an oil and it turns to a milky texture when water is added. Because it is an oil, my skin is left feeling silky soft and nourished when I use this so it is perfect for the summer months, especially on a sun holiday. 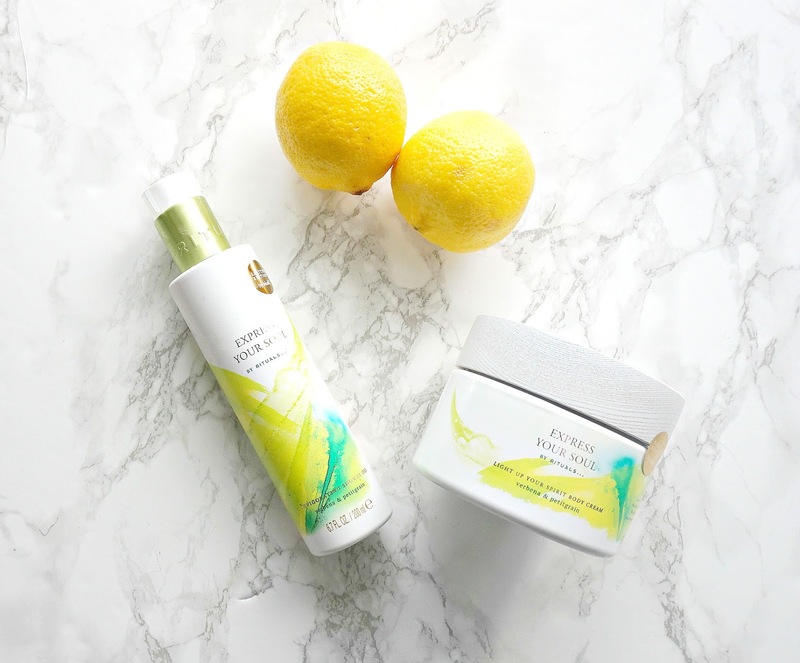 There are no parabens or mineral oils in either of these products. It is priced at €8.50 in Arnotts or £8.50 from John Lewis. The body cream comes in a 200ml tub with a white wooden lid - it's sturdy and quite weighty so not ideal for travel. The cream itself is quite lightweight and it absorbs instantly but really moisturises the skin. It has a slight shimmer to it, but nothing glittery - it just leaves the skin looking healthy and nourished and, of course, smelling beautiful. It is priced at €17.50 in Arnotts and £19.50 in John Lewis. I love summer and sunshine so anything that makes me think of that (especially when it's freezing outside - we seem to have reverted back to winter! ), is always a winner for me but this particular scent combination is particularly special. Just to be clear, this post is not sponsored - I bought the products myself but I just love the range. Do particular scents trigger memories for you? I would love to hear what your favourites are? Please tell me in the comments below!